IMG_2164, originally uploaded by All Things Mimi. I have already blogged about the impending demise of one of my favorite restaurants in Savannah- the Middle Eastern Cafe. This is my attempt at making the hummus served there. I tried to include as many measurements as I could, but as you will see when you read the recipe, it was very difficult. This recipe was hard to figure out because the man who described it to me used no standard measurements. Everything was hand motions and portions of his palm. I basically started by putting the chickpeas and the garlic in my Mom’s food processor and whizzing them around for a few pulses. 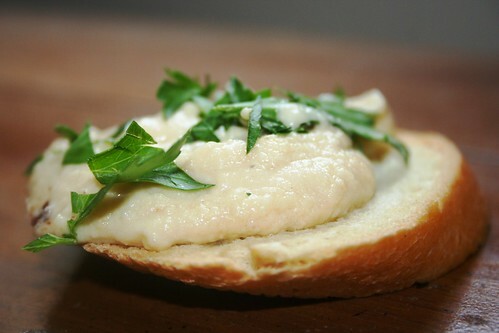 I then added about half the lemon juice, a pinch or two of salt, a pinch of pepper and about ½ cup of tahini. I let the processor run for about 30 seconds and began streaming in olive oil. After about ½ cup, I put in a few capfuls of white vinegar. Then I tasted it- it was nowhere near the flavor or texture of the good stuff. So I turned the processor back on, put in a generous pinch of sugar, more vinegar, more tahini, more salt and more lemon juice. I ran the processor until it broke (sorry Mom!). The flavor was great, but I still had not processed it smooth enough. Luckily, Mom had another smaller food processor- so I began processing it in small batches, adding a little of the reserved chick pea liquid and more olive oil to each batch until it was smoother (like almost completely emulsified). This took much more oil and much longer in the processor than I ever imagined. I really don’t think it’s as good as the good stuff, but it is pretty dirn close. My sister requested this for her birthday dinner- so I guess she’ll be the final judge! Hello My Friend from afar! I have hummus in my frig right now. 1/4+ cup chick pea liquid to help get it to the right consistency.